Hi guys! I'm Cassie, from Hi Sugarplum! 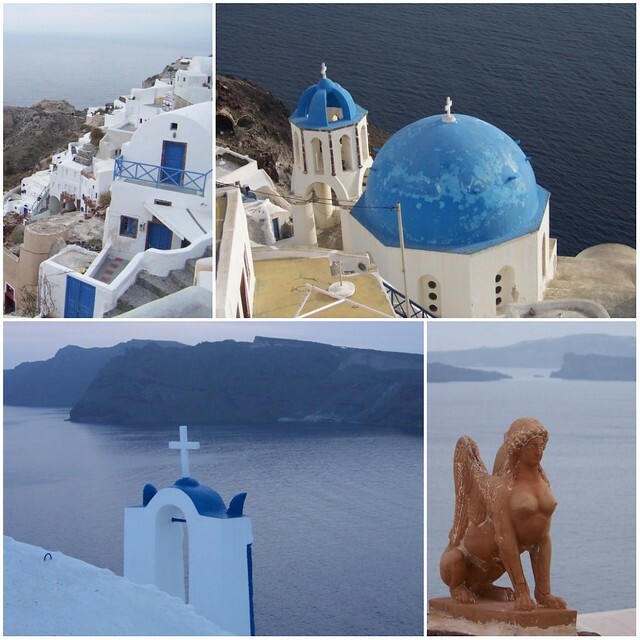 I was thrilled when Shelli asked me to share our trip to Santorini. One of the main reasons I DIY at home, is to save money for trips like this! 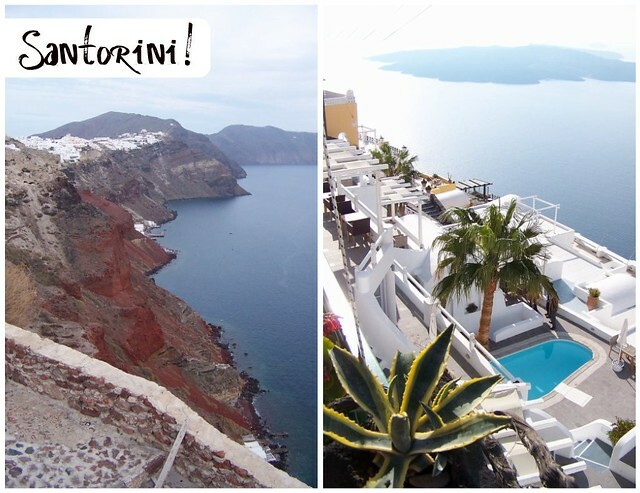 Santorini is one of the more well-known islands in Greece....and the place of my dreams! It was on my radar because of Sisterhood of the Traveling Pants (very discerning traveler). After that movie, I was desperate to see the blue domes for myself. Santorini was a volcano that exploded 3,600 years ago causing the Aegean Sea to flood in and create the great bay. The sugar-cube houses are built into the side of the exposed cliff, and the views are more breathtaking than imagined. Mr. Sugarplum and I visited November of 2007 (off-season), and felt as if we had the island to ourselves. We flew in from Athens (but I've heard arriving at the port by boat is unforgettable). The airport is on the flat backside of the island, and as the cab drove us to our hotel, we wondered where was all the beauty we'd heard so much about! The driver left us at the road and instructed us to walk down the stairs...there we were met with the breathtaking views! The famed blue domes, set against the white-washed town, did not disappoint. The island, with all it's iconic images, is pure magic...and beyond romantic. 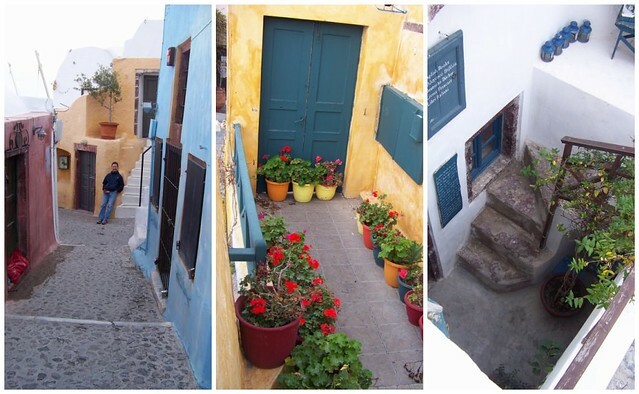 Bright colors, hidden nooks, and caves dug out for homes and shops are around every corner. Watch the sun set from what feels like the top of the world. 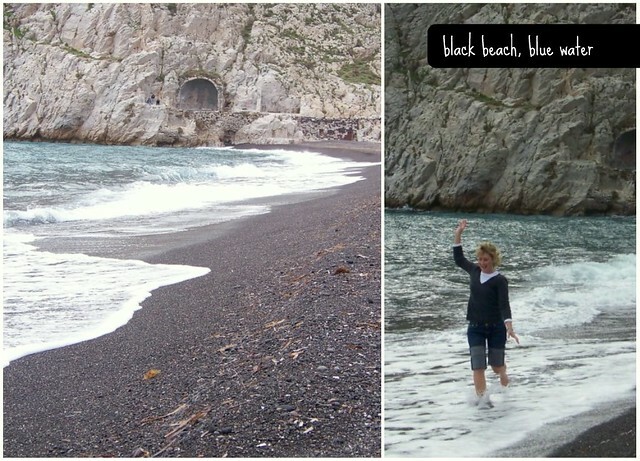 We rented a car one day to explore, and even though the temperatures were cool, there was no denying the Mediterranean Sea! Book my one way ticket, please! Santorini could definitely be my final destination! I've yet to discover a more special place than Santorini, but I'll keep searching and get back to you! * We went during off-season and had the island to ourselves. I'm sure Summertime in Santorini is unforgettable too, but we heard the crowds are stifling then. And prices are more than double! 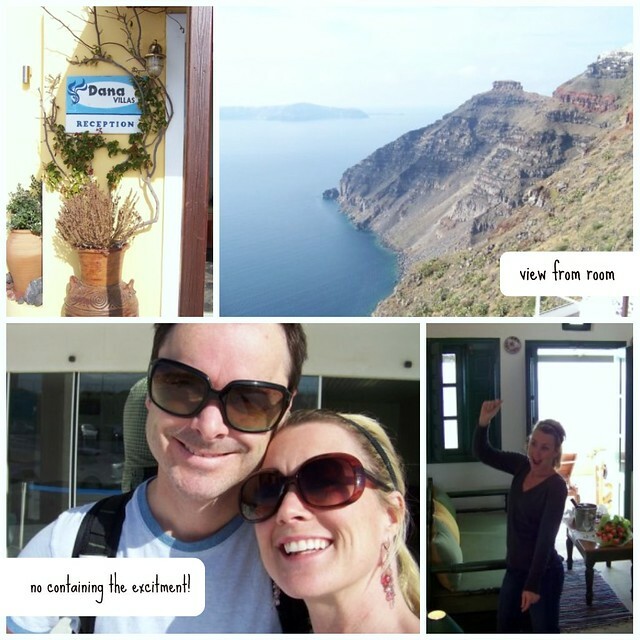 * We stayed at Dana Villa in Firostefani, which is between the busier (port) town of Thira, and the picturesque, but more isolated, town of Oia. I don't think you could go wrong with any hotel that faces the caldera. * I hope you like feta cheese. Large chunks are served with every meal. Divine. 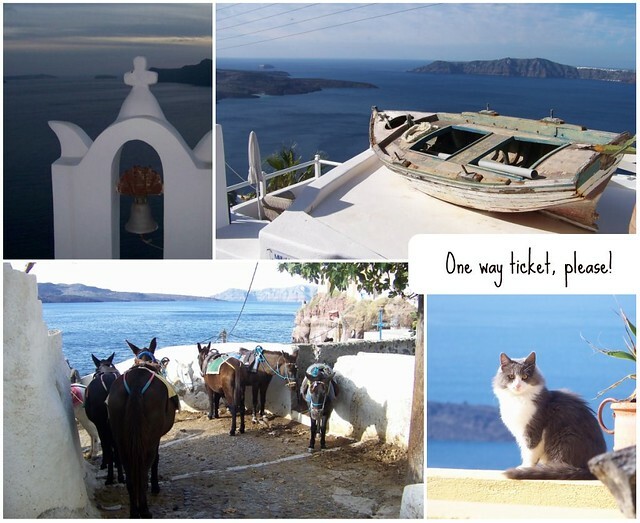 * The entire island can be explored by car in a single day...multiple beaches, a vineyard and small towns. * Aegean Air was a great, inexpensive airline that flew us the short way from Athens. 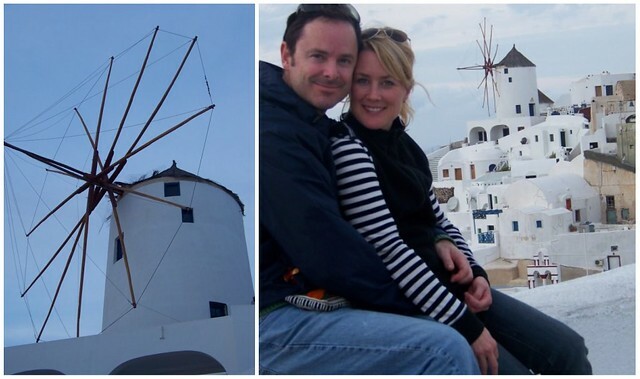 Thanks for letting me relive the memories of our time in Santorini, Shelli! 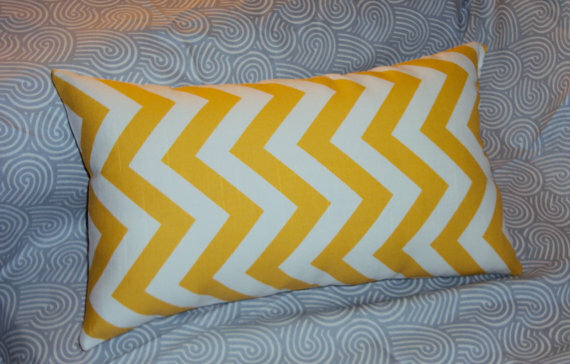 You can check out more of our trips, a little bit of fashion, and a lot of DIY home decor on my blog, Hi Sugarplum! Santorini looks absolutely divine! sigh! Cassie definitely knows how to vacation, this trip is going on my wish-list for sure! 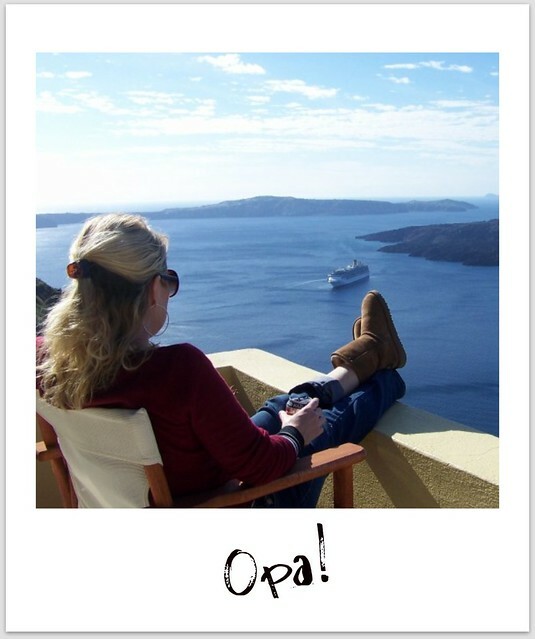 Oh, I wish I could be air lifted to Santorini right now. Such a beautiful location and Cassie did such a wonderful recap. Santorini has been on my wish list but Cassie just moved up up to #1! Gorgeous! 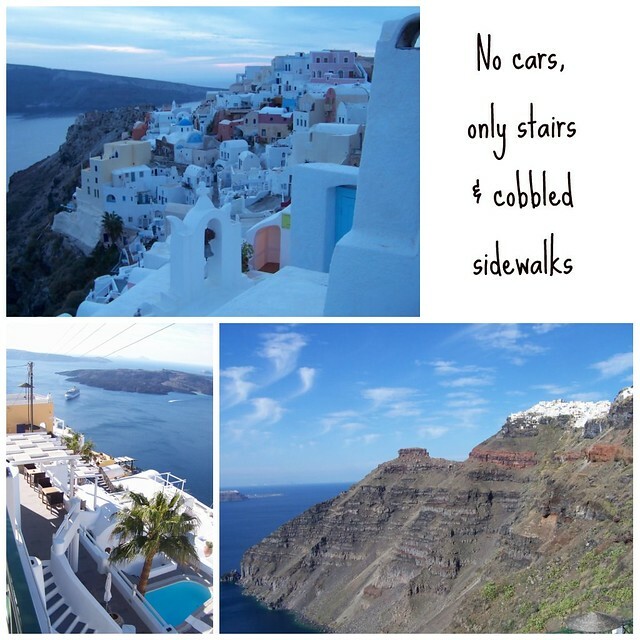 The views are breaktaking, love the cobblestone sidewalks and feta! What a wonderful trip! Now I've got the "travelin' joneses"! Thanks for sharing, Cassie ~ this is on my bucket list now! 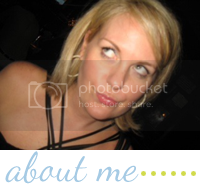 I am so glad to find your blog thru Casssie. So funny I have had your nursery picture saved in my inspiration file for ages but couldn't remember where it came from! Your house is lovely as is your blog. Now I am adding Greece to the top of my list of must travel places. Casseie always takes the best trips! Santorini is beautiful from what I can see! My cousin got married there and actually stayed there for their honeymoon. Maybe one day I can make there! Thanks for sharring. Cassie is my bloggin' buddy crush. I adore her. I heart Cassie- great to see her here! 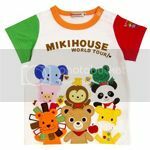 I just found your blog and I am an American living in Athens, Greece. Every time I have visitors I always make sure they visit Santorini! I've been to almost all of the islands by now and Santorini is the most beautiful to me! If anybody visits Greece this is a must!! The islands are what Greece is all about!